The US President said today that he should know what happened to Jamal Khashoggi, who has been missing since 2 October, “within days”. US PRESIDENT DONALD Trump today denied covering up for ally Saudi Arabia in the suspected murder of a critical journalist and said that he should know what happened to Jamal Khashoggi within days. The president said he would get a “full report” from Secretary of State Mike Pompeo on the diplomat’s return from meetings with Saudi and Turkish leaders and that he’d then know the truth. We will probably know that by the end of the week. 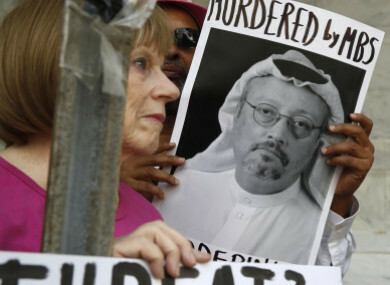 The US president has been on the defensive ever since Khashoggi – a US resident and Washington Post contributor who had criticized Prince Mohammed – vanished on 2 October after visiting the Istanbul consulate. The controversy has blown a massive hole in Prince Mohammed’s bid to promote himself as the modern face of Saudi Arabia and led to a spate of cancellations by attendees at a major Riyadh investment conference scheduled next week. But Trump has slow-pedaled on the possibility of action against Saudi Arabia, which he has repeatedly praised as a historic customer for the US weapons industry. Earlier today, he told Fox Business that the US relies on the kingdom in the fight against terrorism. Turkish police began searching the residence of the Saudi consul in Istanbul today for their investigation, with forensics experts in white overalls entering the building. The Saudi consul Mohammed al-Otaibi left Istanbul for Riyadh on a scheduled Saudi flight yesterday afternoon, with Ankara insisting he had not been expelled but left of his own choice. Turkish police also carried out an eight-hour search at the consulate itself on Monday night taking away soil and DNA samples. Erdogan said toxic material was found which had been “painted over”. Several US media outlets said on Monday that the Saudis are preparing a report that Khashoggi’s death resulted from a botched interrogation. However, there has yet to be any sign of this being published. The New York Times reported yesterday that a suspect identified by Turkey was a frequent companion of the prince’s. Three other suspects are linked to his security detail and a fifth is a high-level forensic doctor, the Times said. International Monetary Fund chief Christine Lagarde was the latest to pull out of Prince Mohammed’s much-trumpeted investment conference next week. An IMF spokesman said she had postponed her planned trip to the Middle East with a stop in Saudi Arabia. The top US diplomat said that in Saudi Arabia he stressed the “importance of them conducting a complete investigation”. “They made a commitment that they would show the entire world the results of their investigation,” said Pompeo, adding that Saudi Arabia also vowed that no-one would have immunity. Email “Trump denies covering for Saudi Arabia over missing journalist”. Feedback on “Trump denies covering for Saudi Arabia over missing journalist”.